Turn your manual tasks into automated workflows to increase efficiency and accuracy in your agency. AgencyBloc specializes in health and life verticals, which gives us the advantage of understanding triggering events that kick off important processes for health and life agencies - such as turning 65, policy renewal/effective anniversary approaching, agent E&O expiration approaching, and so on. Because we have this understanding, we can offer pre-defined triggers in our workflow solution, and allow agencies to design emails and activities that should be sent/created as part of these important processes. Automation brings your agency efficiency and assurance that nothing is being missed. 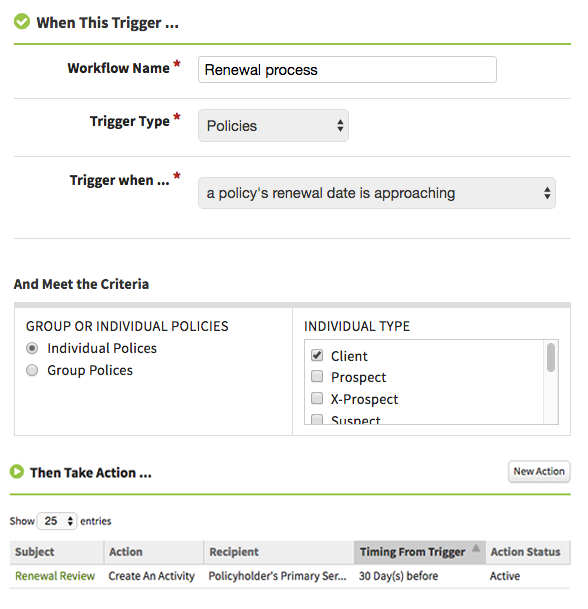 AgencyBloc has created an automated workflow component where you can create Automated Workflows stemming from data in the Group, Individual, Policy, Agent and Activity sections of AgencyBloc. No longer will users have to manually add activities for certain tasks, nor will they have to manually notify someone that something happened. These steps will automatically occur after users create automated workflows for their business steps. By definition, "workflow" is the sequence of processes through which a piece of work passes from start to finish. For insurance agencies, Automated Workflow is a way to automate pieces of business processes. No longer will these steps be manual, and you'll immediately know everything assigned to you by looking on your Activities dashboard. AgencyBloc includes pre-built industry-specific automated workflows. You can use these workflows as-is or edit them to be more personalized to your agency. Also, our pre-built workflows give you simple ideas of where to get started in building your own workflows.